Breast milk is the perfect food for a human baby’s digestive system. Your newborn should be nursing eight to 12 times per day during about the first month. In the beginning, mothers may want to try nursing 10 to 15 minutes on each breast, and then vary the time as necessary. 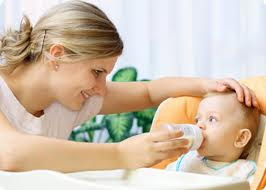 Most experts suggest you nurse or feed your baby whenever he or she seems hungry. You can introduce solids any time between 4 and 6 months if your baby is ready. Until then, breast milk or formula provides all the calories and nourishment your baby needs and can handle. His digestive system simply isn’t ready for solids until he nears his half-birthday. and your baby will give you clear signs when he’s ready to move beyond liquid-only nourishment. Head control: Your baby needs to be able to keep his head in a steady, upright position. Losing the extrusion reflex: To keep solid food in his mouth and then swallow it, your baby needs to stop using his tongue to push food out of his mouth. Sitting well when supported: Even if he’s not quite ready for a highchair, your baby needs to be able to sit upright to swallow well. Chewing motions: Your baby’s mouth and tongue develop in sync with his digestive system. To start solids, he should be able to move food to the back of his mouth and swallow. As he learns to swallow efficiently, you may notice less drooling though if your baby’s teething, you might still see a lot of drool. Significant weight gain: Most babies are ready to eat solids when they’ve doubled their birth weight and are at least 4 months old. Growing appetite: He seems hungry even with eight to ten feedings of breast milk or formula a day. Curiosity about what you’re eating: Your baby may begin looking at your bowl of rice or reaching for a forkful of fettuccine as it travels from your plate to your mouth. Your baby’s appetite will vary from one feeding to the next, so a strict accounting of the amount he’s eaten isn’t a reliable way to tell when he’s had enough. If your baby leans back in his chair, turns his head away from food, starts playing with the spoon, or refuses to open up for the next bite, he has probably had enough. If it’s not an allergy, more likely than not that itch in the back of your throat is the beginning of a cold, flu virus, or a strep bacterial infection. Stop the itch in its tracks before it develops into a full blown sore throat, laryngitis or cough and/or, if you’re already sick, fight back with garlic. Although there are numerous herbal remedies for sore throat, coughs and laryngitis, such as the throat soothing and cough suppressing syrups and drops made with sage, eucalyptus, anise, fennel and peppermint, garlic is probably THE “hit and won’t miss” remedy of them all! Sucking on a medicated lozenge or cough drop may reduce the irritation and pain by coating your throat, but to kill the virus or bacteria and prevent its progression into something more serious, try garlic! For the braver and less patient souls, you may want to take the very fast and direct approach if you dare: peel a clove of garlic and bite off a smallish piece, chew it down and swallow it slowly. The chewed garlic mixes with the saliva and makes it rather easy to swallow. Your tongue may tingle and slightly burn, but should not be of concern if you only take a small bite. Another direct approach is scraping a clove or two of garlic on a piece of bread with olive oil and a pinch of salt. Chew well and swallow slowly. Using bread with olive oil or any cooking oil or butter reduces any burning sensation. The itch and sore throat may subside and completely disappear. Since getting a lot of fluids is recommended when sick with a respiratory illness, such as flu or cold, juicing with garlic can kill two birds with one stone; that is, juice your carrots, apples, ginger together with a few cloves of garlic. This way you get the vitamin-packed liquid plus the potent antibiotic and immune enhancing benefits of the garlic all in one. Surprisingly, the carrot juice plus garlic is quite tasty and not at all “garlicky”. For best results, repeat several times a day while ill. If you’re not brave enough to down it straight up, then chop a couple of cloves into that chicken soup that’s so good for colds! And get some garlic into a sandwich to go along with that soup, too! Whenever possible, it’s best to use raw garlic to preserve garlic’s powerful sulfuric compounds, though cooked garlic also preserves some of its curative powers. Garlic supplements in capsule form can also be protective and useful. Continue including garlic in your food (cooked vegetables, fresh salads, soups, stews) or in supplement form, during and after your bout with a cold, the flu, laryngitis or sore throat! Avoid sugar and alcohol, as well as caffeine while you’re sick (they reduce immunity). And, of course, rest, rest, rest! Be sure to see a doctor when a cough, sore throat, or pulmonary infection lingers beyond a 2-3 week period to rule out any more serious illness. Get emergency treatment for shortness of breath, if symptoms get worse, or when phlemn is at all bloodied pink or red. Chinese medicine reducing weight is opposite for more scientific, it will according to the different physical for different method reducing weight adjustment, below to see according to different situations obesity, TCM has taken method reducing weight is about, you can also on its own accordingly, recruit to the most suitable way, to let your weight loss in planning to blind. Because the pressure caused by obesity also known as the liver fermented obesity. Stomach Stress liver (Chinese medicine “liver” in addition to have western medicine’s liver function, but also the central nervous system, nervous system, sports the function of nervous system) function descent. Or even affect the stomach, make stomach fever, appetite abnormal exuberant. The main symptoms for: this type of person, the mood is a fidgety will appear a good appetite, headache, eyes congestion and other symptoms. Some girls, pressure, mood, tired of eating sweets, may say is fiercely’s typical of this kind. Symptomatic medicine: this kind of obese people can take big entrapement soup. This kind of medicine has inhibit excessive reaction, eliminate stress restlessness, inhibit the role of digestive organ very excited. Scientific name for “hemopenia fat”. Blood is insufficient, because body basic function drops, metabolic function anomalies, and eventually lead to obesity. The main symptoms for: appetite is normal, but the pubis full outstanding, hands fine but body fat, that is “to steal a fat”. This kind of fat person because of “qi” (simple said, is life energy) is insufficient, and cause digestive function drops, metabolic abnormalities, have inappetence, no serious eat but love snack tendency. The main symptoms for: easily fatigue; Movement can love sweating, asthma; Afraid of the cold love cold; Fewer urine; Swollen YanPao etc. Symptomatic medicine: sweet sand six sons soup. It has restored “qi”, increase digestive organ function, make body metabolization normal function. But the accumulation of unnecessary physical body combustion exhaling, achieve the result that reduce weight. As the name suggests, this kind of person that’s voracious “big diner”. Such people as will force a diet, can temporarily thin come down, but once control appetite, have will rebound back, and there will likely be more fat than ever before. Actually, “is the common fault of the people who are battling a fire, so by taking medicine, can rise to eliminate fire, qingchang effectiveness. Meanwhile, weight will also mitigated. The main symptoms: general, but thumbs and appetite; to Don’t like to exercise; Eat a meal was feeble like to lie down; His mouth to be sticky; Urine impassability; Easy bad belly; Morning up eye dropsy, etc. Symptomatic medicine: this kind of obese people can take the holy scattered and stomach fangfeng) soup. Have diuresis, the effect that reduce weight. Adults just want to sleep until the cold is gone, unfortunately, most kids aren’t wired that way. They need to sleep, but feel too bad, or their nose is too stuffy, or they keep coughing, or something prevents them from the sleep they desperately need to feel better. And, this is keeping you awake and dropping your defenses of getting that nasty cold that really is inevitable because your sleeve has become a kleenex. I’ve got a couple tried and true tricks up my sleeve that have helped my little ones in the past. Hope they help you too! An oldie but a goodie. If your little one is over a year and shows no sign of allergy to it, a teaspoon of honey (either straight up or mixed in some tea) should calm those coughs for a little bit. It’s not an allnighter fix, but good for a nap. There is nothing worse than that awful dry tickly cough in the back of your throat when you’re trying to sleep! Humidifiers do a great job of getting enough moisture in the air to soothe that tickle. Get one with a little spot to throw in some Vicks stuff and it’s a double whammy! I know there’s some debate over cool mist or warm mist. We use a steam vaporizer and it helps keep the room warm and does a great job of soothing coughs. As long as you clean it on a regular basis, you’re good to go. If you’re little one is over 2 and honey is just not cutting it. Give Hyland’s a shot. It’s all natural and works pretty darn well. There are a couple different kinds offered: Cough Syrup with Honey and Cold and Cough. I found that the Cold and Cough version actually worked better than the Cough Syrup and my son liked the taste of it better too (go figure). There is also a Nighttime version. I was able to snag a free one a couple months back but haven’t tried it yet. I’m pretty sure I’ll be trying it out on my son tonight though! Vick’s Vaporub….on the bottom of their feet! Say what, crazy lady? Yeah, sure, you can put it on their chest and back like the bottle says to. But, next time, throw some on the bottom of their feet too, just for kicks and giggles (remember to put socks on over it so it doesn’t rub off on their sheets). I was super skeptical of this at first. Last year my son had a nasty cough and none of the above remedies were helping him at night. He was just non stop coughing all night…he would sleep through it, but not so much me. (I was suddenly aware of why my mom would wake me in the middle of the night and shove Robitussin down my throat…to this day I can’t stand anything cherry flavored…I think I’m traumatized…)…anyway, my sister mentioned putting the Vicks on his feet and I rolled my eyes and laughed. But, after hanging up the phone, in my desperation and sleep deprivation…I Googled. I was overwhelmed by the sheer number of people saying how it really truly does work. So, I said, What the Hay, there’s no harm in tryin! This is now my favorite method for soothing a cough!! It’s simple and easy and lasts for HOURS! My oldest has a nasty cough and I tried all of the above for 2 nights in a row with little success. My husband has always been after me to prop him up with an extra pillow but we have never needed to. This time around though I was desperate, the poor kid was just having horrible coughing fits. So, I creeped in, propped him up with an extra pillow (he was so sound asleep he didn’t even wake up) and I swear to you, he did not cough once the rest of the night! Hopefully a couple of these tricks will work for you in helping your little one (and you!) get some sleep this coming cold season.